1. Preheat the oven to 180°C, gas mark 4. Put the biscuits in a food bag and crush with a rolling pin until broken into small pieces. Tip into a bowl and add the butter, sultanas, spices, sugar and lemon zest. 2. Cut a 1.5cm-thick slice off the top of each apple and reserve for lids. Using an apple corer, remove the cores from the apples. Turn the apples upside down to make sure you’ve removed all the core, if necessary pushing the corer back through the bases. 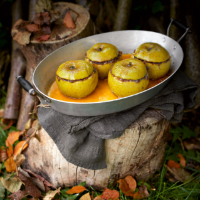 Place the apples in a shallow baking dish or small roasting tin. 3. Push as much of the biscuit mixture as possible into the centres of the apples. Spread any remainder over the cut surface and press the lids down gently on top. Pour the pear or apple juice and lemon juice around the apples. 4. Bake for about 40–50 minutes until the apples are soft and golden. Leave to stand for 10 minutes, then transfer to serving plates and spoon any buttery pan juices over them. Serve warm. This recipe was first published in Tue Aug 25 10:49:00 BST 2015.